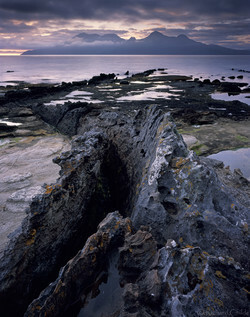 A few days ago I received a very kind email from a client who attended my recent photographic tour to Torridon. Having thoroughly enjoyed the five day workshop he made a comment that finally helped me answer a question I have been asking myself for some considerable time. Why photography? For those of you who don't know I trained as an orchestral Timpanist/Percussionist, graduating from The Royal Academy of Music in 1988. For the next sixteen years I taught and played (but mostly taught) Drumkit and Percussion in and around London escaping to the hills whenever I could to walk. Living on the edge of the Chiltern Hills I was introduced to quality landscape photography by the husband of one of my wife's ante-natal class friends and set off on the path to where I am today. Having always been in love with the outdoors I quickly fell in love with photographing it and formulated a plan to escape my life of claustrophobic soundproofed rooms and the repetitious nature of a very full teaching timetable. 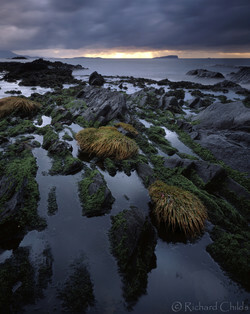 A plan that finally came together in 2004 when I bought my first large format camera and shortly after moved to Argyll. More recently my relationship with photography has become somewhat strained, not particularly because the economic climate has made business and life in general tough but because I have struggled to fathom exactly what I am doing as a photographer and what I personally get out of it. Perhaps to put it differently, why I still love heading out with my camera with a little financial reward for my efforts, huge amounts of frustration when opportunities to travel are suddenly taken away and with the effect, it has had on my relationship with the outdoors (more on that in a minute). 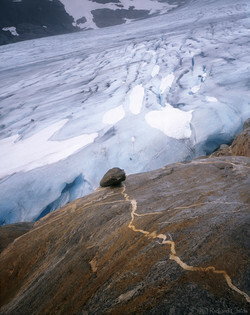 For the vast majority of landscape photographers, the activity is, in reality, a hobby. 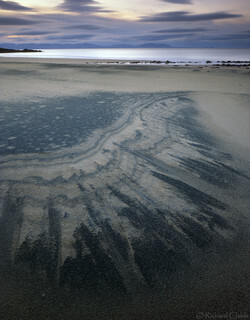 There are very few photographers actually succeeding to make their entire living shooting landscape. Most professionals (quite sensibly) undertake all sorts of commissions, shoot weddings, portraits, interiors, whatever pays. There are many more who hold down regular jobs to provide stability but still have impressive websites and produce prints, books and calendars etc. 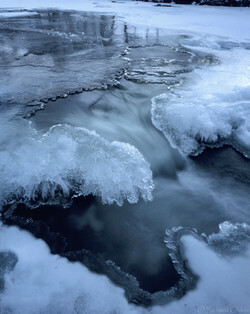 For most of these landscape photography is the escape, the chance to get out, clear the mind and be creative. I have chosen to immerse myself fully in the world of landscape photography as being outdoors is such an important part of my life. The reality, of course, is that for every hour I spend out with my camera I spend another two or three indoors, processing film, managing the library of images, producing a saleable product and then marketing it and myself to the world but I knew that comes with any business you run yourself. 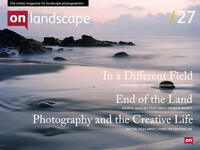 What I wasn't expecting, however, was that when I was out photographing I began to feel disconnected from my surroundings and a full outdoor experience (should the one reader of my blog also subscribe to this magazine then you will have read my post on this). You can find the article here. So why is it that having sounded fairly downbeat about my career choice so far would I not have it any other way? Why do I still feel driven to go out and photograph every day whether I can or not? The answer came in the words of my clients' letter. He was commenting on the strapline on my website, 'Light. Camera. Passion' but suggested that I add a fourth word, 'Discovery' since that had been a defining feature of his experience in Torridon. I realise now that it is a discovery that drives me and my photography. There are always two words in my head while on location, 'What if?'. What if I go round the next corner? What if I follow this river a little further upstream? What if I walk to the top of the next hill on this ridge? What if I stay out in this storm rather than packing down and leaving? This questioning has lead me to many wonderful discoveries over the years and gets me way off the (photographic) beaten track to make images in original locations. Even in well known places, there are many many more undiscovered viewpoints and angles to work. The thrill of finding something new and unique to me and then hopefully being able to make sense of it in camera keeps me plotting and scheming to get out more. 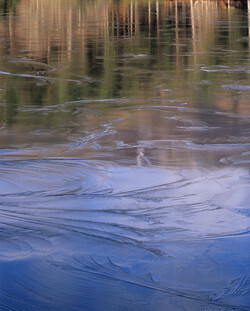 The clients with me when we arrived at Hospital Lochan on one of my Glencoe workshops to find the above conditions will remember just how animated I became. 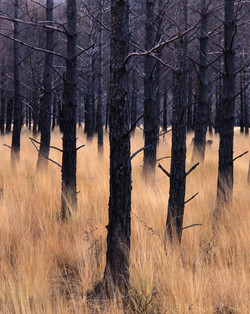 In Torridon two weeks ago the burnt forest presented us all with subject matter we had not previously seen. 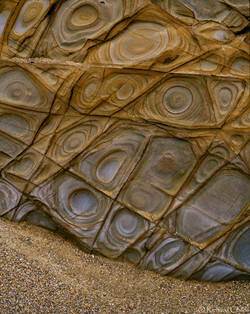 Walking to the far end of Widemouth beach led me to discover geological features I had never seen. Clambering over repeated jagged basalt dykes and slippery sandstone platforms I eventually arrived at a section of Laig Bay I had not seen in any other photograph before. The great thing is that if you look hard enough you really don't have to travel far to find something new and extraordinary, it's often right on your doorstep. I know what you're all thinking, I've got a pretty damn good doorstep where I live with Glencoe only twenty-two miles away but often things conspire to make even that too far. While returning from Torridon last weekend the cam belt on my car broke causing more damage to my engine than I can afford to repair or replace at the moment. So, I find myself facing an on coming Scottish Winter season with no means of getting out and about. 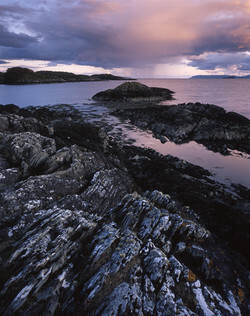 So, a massive change of plan then, I live on a small peninsula North of Oban, it has miles of unexplored and very rugged coastline, two or three secret bays, fabulous ancient woodland, ruined cottages and tremendous views to the islands. There's very little of any commercial value here because it's not on the tourist trail but I am so looking forward to spending all my available time out making a series of images within a few miles of my home that no one will have seen before. Mineral Staining, Red Point, Gairloch.